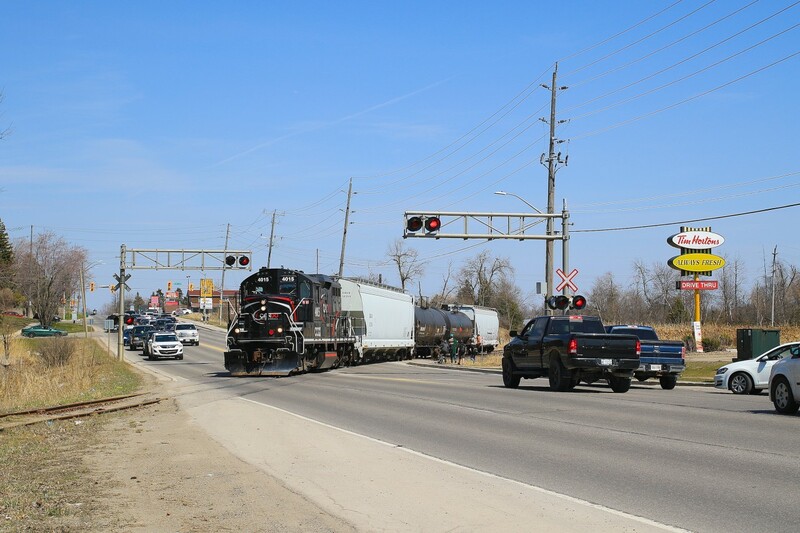 Railpictures.ca - Craig Allen Photo: CCGX 4015 slowly crosses Broadway with four cars in tow prior to backing down a spur to service the PolyOne facility. | Railpictures.ca – Canadian Railway Photography – photographie ferroviaire Canadienne. Caption: CCGX 4015 slowly crosses Broadway with four cars in tow prior to backing down a spur to service the PolyOne facility. Arnold & Kevin: Thanks for the comments, I was quite happy to get this shot. This is pretty much as far north as the railway goes as the only reason to cross over Broadway is in order to pass the switch and back down the spur on the right. I attempted this shot on three different days and the other two were not successful as the crew did not switch the industries in the north end of Orangeville. Great capture…I can’t imagine this line being heavily used. Now that is going to be a very nice “memory” photo!! Well done.